Hey, Rover, ya dumb mutt, where are you, bonehead? 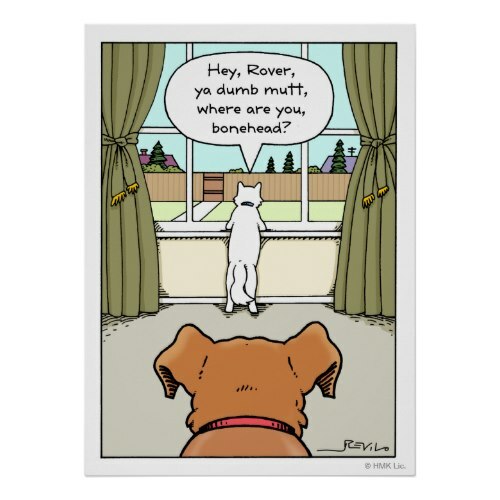 Funny, hilarious, cartoon poster featuring Rover the dog, and a feline looking out a window calling him names. A feline calling out to trouble, is what it is. A fun, humorous cartoon by Oliver Christianson, also known as Revilo ("Oliver", spelled backwards), featured here on a Hallmark poster. Fun poster to add a touch of humor to your walls. Great for room decor, decor of the man cave, living room, and more. A completely customizable poster. You may choose its size and even have it framed, when ordering. Makes a fun gift for dog owners, dog lovers, pet owners, friends and family.